1890 - NE corner of 1st. and Washington Sts. 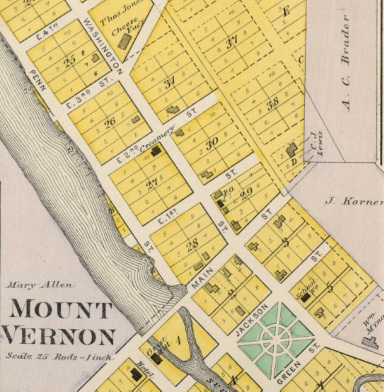 In 1854 Mount Vernon got its post office with Hall C. Chandler as the postmaster. In 1856 I.G. Brager, Sr. became postmaster and the post office was in his general store. Onon B. Dahle, formerly of Daleyville, moved to Mt. Vernon in 1877 and bought the store. He then became postmaster. Frank Moore, president of the phone company for many years, was also the postmaster. Prior to 1900 before RFD, people came to the post office to pick up their mail. Often this trip would include dropping off milk at the creamery. The post office closed in 1902. In 1903 it became a rural post office of the Mt. Horeb Post Office. By 1933 the Mt. Horeb Post Office had RDF routes to serve the area.